Animals Rule in Children's Literature: Frogs and Caterpillars and Bears - Oh My! From very hungry caterpillars and penguins for every day of the year to the Kingdom of Frogavia, animals rule in children's literature. From very hungry caterpillars and penguins for every day of the year to the Kingdom of Frogavia, animals rule in children's literature. Whether used to teach numbers, colors, or more subtle lessons of morality, animals are the perfect vehicles for conveying tangible and intangible concepts in an entertaining way. The unique not-quite-human yet not-quite-animal characters in the classic Dr. Seuss tales, paired with allegories about honor and even disarmament, set the stage for the next generation of children's books and entertainment. Endearing creatures from Sesame Street (what is a Snuffleupagus, anyway?) and puppets from Mr. Rogers' Neighborhood created a world of make believe that children could call their own. In children's literature, the story is often secondary to the lavish illustrations. "The Very Hungry Caterpillar," for example, wouldn't be nearly as compelling without Eric Carle's illustrations. Likewise, "If You Give a Mouse a Cookie" is clever, but Felicia Bond's illustrations make the book a children's classic. Kristin Zambucka's "Frog Knights" and "Frogavia! Frogavia!" are perfect examples of books that consist of both lavish illustrations and compelling tales. In the first book, frog characters live in their own frog world - the big pond known as The Kingdom Of Frogavia. The true frog king is unseated from his ancient throne and banished to a far, distant pond by an evil ruler. As his bullying and tyrannical rule stretch on, the Frogavian people grow increasingly restless and unhappy. Finally, a group of brave young rebels rise up and go in search of their true king. They eventually find him and he dubs them chivalry frog knights in gratitude for their loyalty. The king, along with a frog queen and frog princesses, return to Frogavia and right the wrongs of the evil ruler. In the second book, the story progresses, with one of the chivalry frog knights asking for the frog princess' hand in marriage, but she marries another. The frog knight joins his friends from the first book to continue on their mission to make good triumph over evil. Zambucka's books are more whimsical than, say, Mary Pope Osborne's Magic Tree House series or Tony Abbott's Secrets of Droon series, but capture the magic of childhood while imparting nuggets of wisdom. 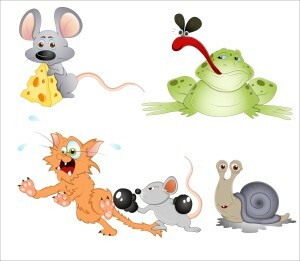 The whimsy and appeal of the characters is that they come from the animal kingdom. There's no doubt that creatures are central to today's children's literature. Whether completely imaginary, such as those in "Where the Wild Things Are," or real, as are those in "365 Penguins," or a little of both, as in "Frogavia! Frogavia! ", kids are captivated by animals that cause the imagination to soar. Copyright © https://alphabetacres.com 2015 - 2019 all rights reserved.